10. What Is The Sound Of One Hand Clapping? Serving the Pacific NW's musical needs since 2008. 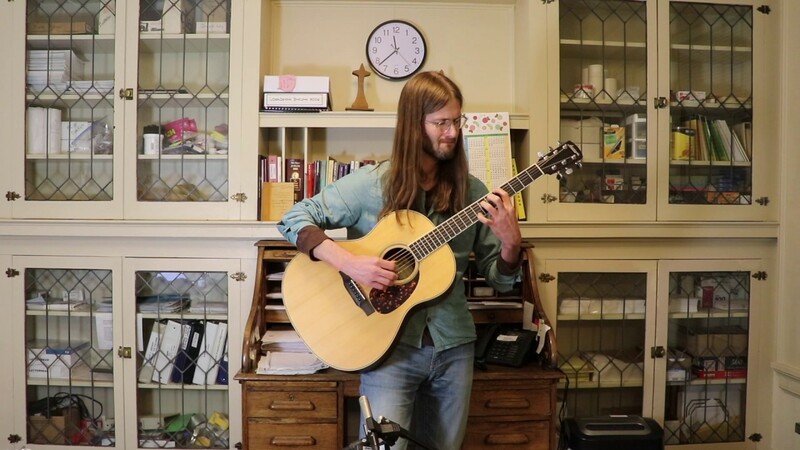 Guitarist John Wayland Harr has provided music for MANY MANY public and private events all throughout the region. His performances have taken him to a variety of venues and locations in Portland, Eugene, Seattle, Eastern Washington, the Mt. Rainer area, the Oregon Coast, the Columbia Gorge, and many other locales. 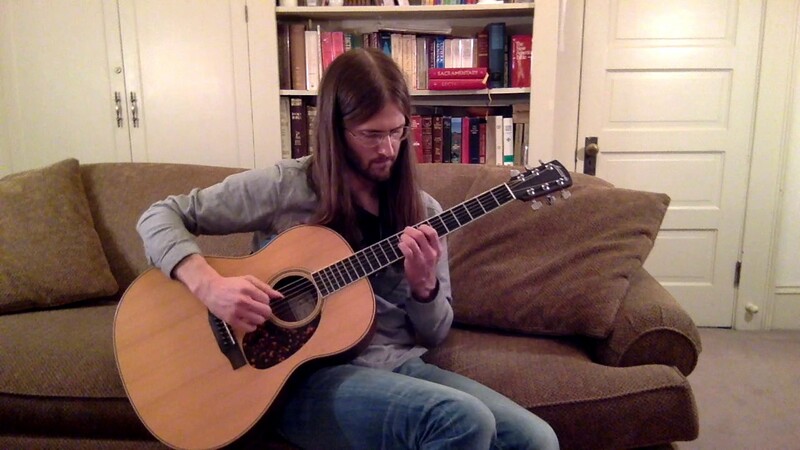 John performs a wide variety of music on acoustic nylon and steel string guitars, and electric guitar including: classical, jazz, pop, Spanish, South American, original, and other styles as well. He is in demand as both a featured performer and a creator of inspiring ambience. Let him know how he can help your musical needs! John is a talented guitarist who made our event special. John was super well-prepared, early, and, with his music, created a great ambience for our event. John played for our house party and created the accent to the moment. I highly recommend John as he was prompt, courteous, and a fantastic musician. I would definately book him again. John provided the perfect music for our networking event. I would love to hear John play in any setting. Our residents loved him and he was so easy to work with. John was terrific and a true professional. He arrived even earlier than expected to set up and practice with our soloist, and needed little to no instruction. His song selection and style was perfect for our wedding. Also, the sound system he brings with him was great for our readers to use and the right amplification for the space. We highly recommend him. 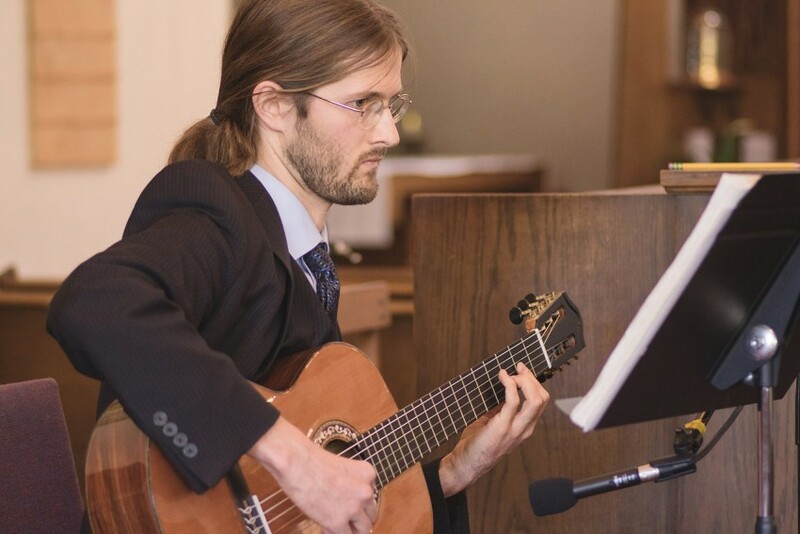 John did an amazing job of playing classical guitar at my son's memorial service this last weekend. He chose just the right kinds of selections to play as background music and was most willing to learn one particular piece we wanted played during the release of doves. He did a beautiful job with the chosen piece. I would highly recommend hiring John for any special event you may be planning. He is easy to work with and very professional. I appreciated his warm and friendly nature. Truly wonderful and professional music. Johns's sound complimented our garden wedding perfectly, and his large repertoire of music was enjoyable for all of our guests. We would highly recommend anyone looking for a guitarist to hire John. John was a great addition to our gallery event. He arrived early...set up discreetly and provided a wonderful backdrop to the evening. we will definitely have him back again. Thanks John! John was an amazing addition to our 10-person wedding! Everyone repeatedly complemented his beautiful acoustic sound. I created a list of requested songs and he provided additional recommendations which went perfectly along with the initial list. He was a pleasure to work with planning out the songs and efficiently responded to any message I would send him. And I highly appreciated his professionalism and composure when there were small roadblocks(the heat outside) during the event. Thank you again John for everything, you are truly awesome and I will highly recommend you to anyone for their own events! What a wonderful guitarist, and very professional.. I'm so thankful that John Wayland Harr was available for our company event. His talent added to the depth of elegance I was looking for. Excellent acoustic guitarist for any special day! John Harr provided the music for my parents' 50th Wedding Anniversary in August 2015. We celebrated their 50th Honeymoon where they celebrated 50 years earlier, on the Oregon Coast. John drove from Portland and was punctual, professional and a delight to have playing during the party. In only enhanced our memorable family and friend moments to hear his beautiful jazz and other guitar pieces. I recommend him for any special day. He was a versatile player and could accommodate pretty much any request. I have friends who are also professional, accomplished musicians in local symphonies and bands that I have known for years and I could easily compare John's Wayland Harr's skills with theirs. I hope he has many successful years of enhancing the special occasions of many more people. Hire him, he's a pro and well worth it! month. John arrived about a half hour prior to playing time and the group loved the music. It was exactly what I hoped for, background music and nice music during dinner. I would not hesitate to hire John again. John's music levitated the ambiance of the evening. He is a fine musician and the music he selected to play was perfect for the event. Book John for your wedding! John did an amazing job. Before the wedding, he responded to all of my emails quickly and was patient with all of my questions. He learned the Oregon State fight song for our recessional for no extra charge and it was wonderful! Alumni that were in attendance recognized it, but the rest of the guests just thought it was a lovely song. It was perfect. He has a lot of experience, so he didn't need to attend our rehearsal....which saved us money. He brought a couple of different lengths of extension cords and even a battery powered amp. just in case. Even my day-of coordinators expressed how easy he was to work with. I would recommend John without any hesitation to other couples...or anyone who needs a musician for an event. I wasn't able to visit my grandmother during her dreadfully long stay in the hospital so bringing music to her through John Wayland Harr was my plan. It was less than 24 hours from my inquiry for music services to the event and every part of the process was effortless as he took care of everything, even corresponding with the hospital beforehand. He provided an amazing retreat within a bustling, noisy hospital care unit. My grandmother was impressed and said, "I couldn't have been more happy with the music or the man that played it. And the last song he played was an original and my absolute favorite." John is a great musician. He was on time, played appropriate musical choice for the venue and really we couldn't have asked for anything more. John Harr was incredibly professional to deal with leading up to our wedding, and was a great addition to our Big Day. He learned three new songs per our request, without charging any extra fee, and nailed all three during the ceremony. It made the ceremony all the more special - both my bride and I had to hold back happy tears walking down the aisle! John then provided the background music for our cocktail hour, with a mix of covers and his own originals. I got many comments about how great his playing was, and how much it enhanced the event. John's rates are competitive, he's easy to work with, professional, reliable, and overall quite friendly. Oh, and a talented musician... obviously. Highly recommended! We hired John to play a very busy cocktail party. He played jazz standards and original music that complimented the occasion, but did not overwhelm the social mood... people were able to talk or listen. He managed to really match the mood of the group. My guests really enjoyed his music and couldn't stop talking about how enjoyable it was to have a live musician! I want to do another party to have him play again. For all he offered, I think he was a steal! Went to the chapel and...got married! John was a total professional. From day one he diffused all potential stress that could come with finding a musician. He communicated extremely well. He provided all necessary information to be able to figure out what we wanted. His advice was helpful AND subtle enough to let us have everything we could have wanted. On the day of, both my wife and I remember only thinking how much we liked the music. There were no concerns or worries and if there had been any mix-ups John played it off like there weren't (we don't even know if there were!). His music was original-sounding and set the mood wonderfully. We hired John for our company's open house in Portland. John was very pleasant to work with and provided excellent background music in the quiet, non-obtrusive way that we requested. The variety of music played was very nice and suitable. We found John to be very professional, easy-going and accomodating and would hire him again for future events. Beautiful music that made our wedding day simply perfect! John was so nice and wonderful to work with and met with us prior to our wedding to discuss details of the event and the music. John is very easy to work with and communication was exceptional! John's music just made our event perfect. I can't imagine the day without his musical contribution! We look forward to catching him at other venues soon! John was excellent! He was very accommodating and always quick to respond to e-mails. Overall, I highly recommend John's services if you're looking for a professional, talented, well-rounded musician. Very pleased! John arrived early to play for our wedding ceremony and stayed late to play through our dinner too. John added the perfect element to our wedding. The playing was beautiful, sweet, and perfect for us. John was very easy to work with and we could not have been more pleased to have booked with John. He was perfect for our winery beautiful wedding. Thanks John for the great performance. You came through on short notice and did a great Job! Hope to use you again. John made our wedding reception even more special! A very diverse performance: listeners will hear a WIDE variety of styles on acoustic nylon and steel string guitars, electric guitar, and loop machine. This leaves no room for musical stagnation and listeners will be engaged at all times. Clients can expect a positive working relationship with Mr. Harr. I have had the privilege of providing music for MANY, MANY wineries, wine bars, cocktail parties, weddings, dinners, restaurants, concerts, and other public and private events in my career. I have been especially busy performing since moving to the Pacific NW in August 2008. I have played for events all throughout this region from Seattle to Eastern Washington, the Oregon Coast to the Columbia Gorge, Southern and Central Oregon, the Mt. Rainer area, etc. I have played at many different venues in this region including: Black Butte Ranch, Tiffany Center, Portland City Grill, Portland Hilton, RingSide Fish House, Surfsands Resort, Cave B Inn, Skamania Lodge, Crystal Mountain, Timberline Lodge, Portland Art Museum, Andina restaurant, many McMenamins locations, private residences, and many other locales. I have also served many corporate clients such as Sunset Porsche, KRUG Champagne, Ste. Michelle Wine Estates, Otak Inc., Umpqua Bank, Macy's, Orvis, PCOGS, and others. My playing style and repertoire is largely influenced by my classical guitar and jazz studies, however, as you can see from my song list I play MUCH more than that. I also play pop, Spanish, Brazilian, South American, Baroque, original, and other styles as well. If you have specific songs/pieces you would like incorporated into your event or if you would like me to focus on a specific style of music please let me know. I am more than happy to learn them or to tailor the playlist to meet your wishes. At my performances you can expect to hear nylon and steel string acoustic guitars, electric guitar, loop pedal, and occasional vocals. I primarily play solo instrumental guitar music, however, I also occasionally use a loop pedal which allows me to create the sound of a full band which can help keep the musical airwaves fresh and interesting. Just let me know what type of services (classical guitar, instrumental pop, jazz, etc.) you would like from me and I will gladly prepare the music you request. I also play in a guitar duo setting that plays primarily jazz. Having a duo has a different energy level and a fuller sound in general. Please let me know if you are interested in having me play in this format. I have had the privilege of working with MANY different clients over the years and I strive to create a pleasant working experience with each one. This includes brides/grooms, restaurant owners, private party hosts, corporate companies, shop owners, and others. I make a diligent effort to respond to all emails and phone calls in a 24 hour period, to be as clear with communication as possible, and seek to fulfill the wishes of whomever I am serving. I should also mention that I really enjoy what I do. It has been my dream to be a professional guitarist since I was 12 years old. I feel very fortunate to be able to do what I love for a living. Thanks again for visiting here. I hope to hear from you! For larger spaces where amplification is required, access to a power source is required.